The best plumbing systems eventually develop cracks, spring leaks and shift underground. Aging materials, invasive tree roots and faulty pressure contribute to pipe problems that can only be solved with replacement. Here at Accurate Leak and Line, we specialize in cured-in-place pipe repairs and restorations that save time, money and landscapes for home and business owners throughout Texas and the surrounding states. As an alternative to traditional excavation and pipe replacement, CIPP technology provides trenchless pipe rehabilitation that works with any type of plumbing system. The process goes by many names, cured-in-place, cast-in-place, or pulled-in-place pipe repair. Our technicians fabricate drain liners that run inside the length of your old pipes and form a structural bond to the material with specially formulated two-part epoxy resin. These liners create a permanent barrier between leaking pipes and your water supply and effectively restore PVC, clay pipes and cast-iron drain lines. If you’ve dealt with plumbing repairs that required excavation, you know the work can take weeks. Our Nu Flow CIPP process cuts that time down to a few days, so you benefit from lower labor costs and a project that goes quickly from start to finish. Yards, gardens and sidewalks benefit from non-invasive technology that eliminates the need for unsightly trenching. 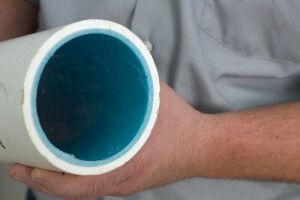 Our epoxy resin pipe lining techniques restore any type of system with a solid infrastructure that outlasts traditional materials, and our work comes with a 10-year guarantee against future leakage. As fully licensed installers of Nu Flow CIPP technologies, our teams have taken care of residential and commercial pipe rehabilitation projects since 2002. Our master plumbers are at your service with the best pipe repair and restoration processes available, and we deliver the highest levels of customer care. From scheduling that works with your timetable to complete job cleanup, you can rely on us to deliver professional service and innovative solutions for all your plumbing problems. Leaking pipes can shut you down at the house or office, but you don’t have to face weeks of excavation work to get things running again. We solve residential and commercial pipe and plumbing problems every day, so you can count on Accurate Leak and Line for expert non-invasive pipe repair and rehabilitation. Give our teams a call today for more information about CIPP solutions that work with your schedule, budget and landscape.